From July of 1861 to April of 1865, the bloody savagery of the American Civil War was waged on many fronts. According to the “American Battlefield Protection Program”, there were 384 significant battles fought over those four long years; battles fought on the farms and prairies, on mountains, in the small towns, and in the bustling cities of the North, the South, and the West. It was a time in American history that has captured the imagination of millions of people. Thousands of books have been written on the war, numerous movies have been made to bring to life the romanticism of those years, and television documentaries continue to educate the American viewers on this historical event. Despite all these academic inputs, there is really nothing that compares to actually standing on the site of a Civil War battlefield. 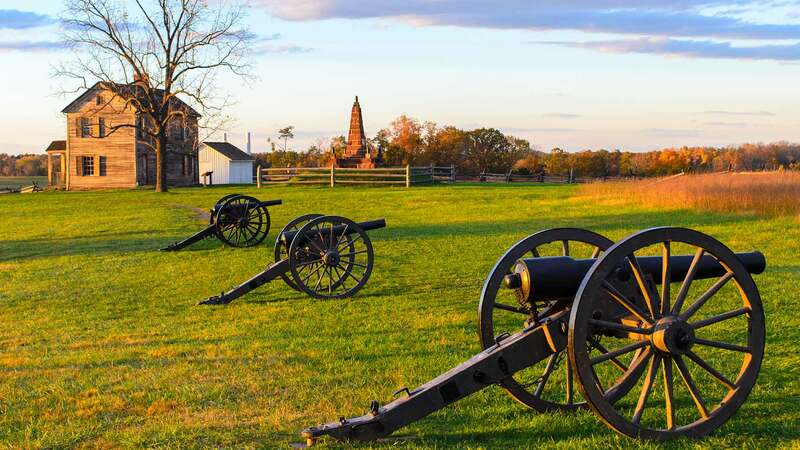 Although the sounds and smells of battle have since faded into the past, the visual perceptions are still alive on those hallowed grounds for the Civil War enthusiast to experience. For those interested in the Civil War who may be considering a battlefield visit, the following itinerary outlines a 7-night, 8-day excursion to eight famous Civil War battlefields and estimates the cost of such a journey. Since the battlefields on the itinerary are all in the east, the hypothetical starting point for this trip is the Bronx, in New York City, and the cost is for a family of two adults and two children. Day 1 – From New York City, the drive to Gettysburg will cover 220 miles and should take about 3.5 hours. After checking into a local hotel for a 2-night stay, the rest of the day will be spent checking out downtown Gettysburg. Here you will find a wonderful array of shops, Civil War relic stores, period homes to visit, museums, restaurants ranging from fast foods and buffets to moderately priced sit-down affairs, and other family oriented attractions. Day 2 – Following breakfast, a short drive from downtown Gettysburg will take you to the Gettysburg National Cemetery where Lincoln delivered his Gettysburg Address. A short distance away is the Gettysburg National Park Visitors Center where you can begin your self-guided auto tour or a 2-hour bus tour of the battlefield. General’s Lee and Meade’s headquarters, museums, and many other attractions outside the park charge around $5 to $7 for adults/$3.50 for children. Although admission to the battlefield is free, bus tours are about $24 for adults/$12 for children. For the kids, a stop at Boyd’s Bear Country is only 6-miles away. Day 3 – Head 53-miles south towards the Antietam National Battlefield in Maryland. On this historic ground the Union army repulsed the first attempt by Confederate forces to invade northern territory on September 17, 1862, the bloodiest single day of the war. At the visitors center you can browse through the museum and store, and view an hour long “Antietam Documentary.” The best way to view the battlefield is to take a self-guided auto tour that brings you to 11 points of interest. Guides are available for 2-hour personalized tours. Admission: $6 per person. Guided tour: $50. Following the visit to Antietam travel another 30-miles south, this time to Frederick, Maryland for a previously booked overnight hotel stay. Day 4 – The itinerary this morning is a short 3-mile drive to the Monocacy National Battlefield. It was here in July of 1864 that Confederate forces marching towards Washington D.C. were delayed long enough by the Union army to strengthen the defenses of the Capital. Since then the fight that occurred here is called “The Battle that saved Washington.” At the visitors center there are interactive and multimedia exhibits, shops, electronic maps, artifacts, and memorabilia for sale. You can also pick up a map highlighting points of interest for your 6-mile self-guided tour of the battlefield. Optional walking trails that interpret the different phases of the battle are also available. Admission is free. Later in the afternoon drive 57-miles to Manassas, Virginia for a one night sleepover before heading to the Manassas National Battlefield. Day 5 – It was on the Manassas battlefield that Union and Confederate forces met for the first time in July 1861, a battle that saw the Union soldiers driven off the field. After browsing in the visitors’ center and the museum, take a self-guided driving tour of the battlefield or follow a Park Ranger for a hiking tour. Admission is $3 per person. The next stop is 3-nights in Fredericksburg, Virginia, only 40-miles to the south. Day 6 & 7 – Today and tomorrow, visit the last four of the eight battlefields. They are the Fredericksburg, the Chancellorsville, the Spotsylvania, and the Wilderness Battlefields. All four are located within the second largest military park in the country, the Fredericksburg and Spotsylvania County Battlefield Memorial. Like all the others, begin the tour at each of the two visitors’ centers, take the self-guided auto tours, and visit the many historical buildings and monuments. Park admission is free. Day 8 – The vacation is over and it’s time to drive the 300-miles back to New York. If anyone was not a bonafide Civil War buff at the beginning of such a vacation, chances are they will be by the time they head home.